og lage 3 julekort i måneden. Denne måneden skal vi lage telys-kort, men det skal jeg blogge senere. I dag er det ett vanlig kort. and make 3 christmascards in a month. In April we are going to made card for tealights, but I will blogg that one later. Today I have a usual card. Innsiden er også litt pyntet. Inside is also a little decorated. Snøkrystallene er laget av metalltape. The snowflakes are made of metal-tape. Hos ABC Christmas Challenge har de "DT-call". Jeg synes det er artig å være på ett team, så prøv du også ! 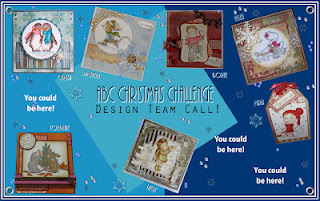 ABC Christmas Challenge has a DT-call this fortnight. It's really fun to join a team, so come on and try ! This is such a pretty, soft toned creation! Great job! Thanks so much for joining our "ANYTHING GOES" challenge at Shelly's Images! Please come back and join us again real soon!! Hello Beret. this is such a pretty card with wonderful delicate colours and lovely design. I love how you have used your punches and dies, fabulous. Thank you for joining in at Lexi's Creations and good luck. What a beauiful image & your colours a brilliant. Love the circle!! Love these soft colours sweetie. I love this image and used it a lot last Christmas. Absolutely gorgeous card. Thanks for playing at OSAAT. Very pretty! Thanks for playing with us at One Stitch At A Time! Best of luck in the draw! that's a gorgeous christmas card! Thank you so much for entering our challenge at Stampin for the Weekend and good luck!